This recipe makes a large 2 layer cake, or an even taller (smaller) 3-layer cake- depending on pan size (see instructions below). 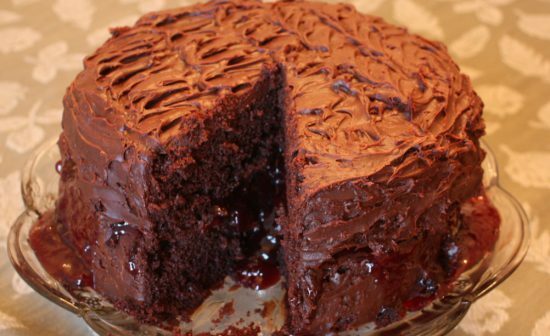 It turns out to be a very moist chocolate cake with a rich chocolate ganache frosting… with a surprise layer of raspberry inside! (I cheated and used Dickinson’s raspberry jam instead of fresh raspberries). Yield: 12 to 14 servings. 1. Prepare cake: Preheat oven to 300°F and grease two 10 inch cake pans, or three 8-inch cake pans. Spray pans with nonstick spray and then line bottoms with rounds of parchment paper- then spray paper too. 2. In a medium bowl combine chocolate with hot coffee. Let mixture stand, stirring occasionally, until chocolate is melted and mixture is smooth. 3. In a large bowl sift together sugar, flour, cocoa powder, baking soda, baking powder, and salt. In another large bowl with an electric mixer beat eggs until thickened slightly and lemon colored (about 3 minutes with a standing mixer or 5 minutes with a hand-held mixer). Slowly add oil, buttermilk, vanilla, and melted chocolate mixture to eggs, beating until combined well. Add dry mixture and beat on medium speed until just combined. 4. Divide batter between pans and bake in middle of oven 50 to 65 minutes, or until tester inserted in center of cake comes out clean. 5. Cool layers completely in pans on racks. Run a thin knife around edges of pans and invert layers onto racks. Carefully remove parchment paper and cool layers completely. Cake layers may be made 1 day ahead and kept, wrapped well in plastic wrap, at room temperature. 7. Transfer frosting to a bowl and cool, stirring occasionally, until spreadable (It may be necessary to chill frosting to reach spreadable consistency). 8. Prepare filling: Puree raspberries in a food processor or blender. Press the puree through a fine-mesh strainer with the back of a spoon, removing the seeds. Heat the puree in a small pot with the sugar and cornstarch until mixture boils, stirring constantly. As it boils, it should quickly thicken. Let cool. 9. Assemble cake: Spread a thin layer of ganache on 1st cake layer- followed by a layer of the raspberry filling. Top with 2nd cake layer and repeat (if using a 3rd layer). If only using two cake layers, cover the top and sides with the remaining chocolate ganache frosting. Cake keeps, covered and chilled up to 3 days. Bring cake to room temperature before serving. * If you use frozen raspberries that are already sweetened with sugar, just leave the sugar out when making the filling. * If you only have two 9-inch round pans or two 8-inch rounds, you can choose to just make a 2-layer cake and then use the rest of the batter to make some cupcakes. Fill the pans no more than 2/3 full with batter- you don’t want them to overflow when they rise while baking!